The growth of bank and automated teller machine (ATM) thefts, particularly with the use of explosives, is a serious and increasing crime that has recently doubled in frequency in Brazil. Anti-theft security inks or anti-theft devices (ATDs) with bank dye security packs are commonly used to deter bank robberies. During a robbery, bank dye security packs are activated by a signal and cause a cloud of dye particles to be deposited on clothes, shoes, banknotes and other objects belonging to the thieves. Laboratory tests can determine the presence of the dye on these crime objects and can link a suspect to the robbery. Fig. 1. 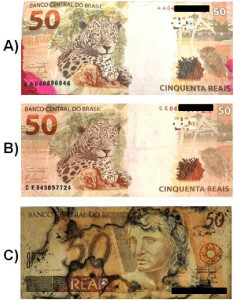 A picture of one banknote each from the three sets of true forensic samples of seized banknotes with different ATD contamination: A) banknote recognized to be from an exploded ATM, presenting apparent ATD dye on the surface; B) banknote suspected to be from an ATM explosion followed by ATD impregnation, presenting characteristics of an attempted cleanup procedure with the use of organic solvents; C) banknote impregnated with a dark substance probably due to an attempt at cleanup using oxidative methods and/or high temperatures. Specifically, the ATD stains the stolen banknotes, and should make them worthless and nontransferable after being illegally removed from a bank (Fig. 1), such as in ATM explosions. In some cases, the thieves try to clean and bleach the painted banknotes, but instrumental analytical methods should allow this procedure to be tracked. Previous studies into the extraction and identification of security dyes from banknotes have concentrated on dye-stained paper currency such as that used in the USA. The most common ATD used to deter bank robberies consists of a red dye marker, 1-methylaminoanthraquinone (MAAQ). Other types of ATDs applied include pepper spray products, such as capsaicin, dihydrocapsaicin, and nonivamide, and tear gasses, such as orthochlorobenzalmalononitrile and 2-chloroacetophenone. A less common red dye for this purpose belongs to the Rhodamine family. Recently, a series of desorption/ionization techniques applied directly to surfaces for direct ambient mass spectrometry analysis has been developed and has revolutionized the field of forensic analysis by guaranteeing sample preservation and the absence of sample preparation (Fig. 2). Ambient mass spectrometry was pioneered by desorption electrospray ionization (DESI) and direct analysis in real time (DART), and a variety of related techniques are currently available including easy ambient sonic-spray ionization (EASI) applied in this work. Analysis of bank security devices by MS with ambient ionization has been reported by applying DART-MS to identify MAAQ, orthochlorobenzalmalononitrile (tear gas), and pepper sprays containing capsaicin. Techniques using UV-visible spectroscopy, spectrofluorimetric and electroanalytical methods have been shown to have low LOD for Rhodamine B, although they require sample preparation and dye extraction, cannot distinguish between dyes of the same chemical class, and lose the spatial distribution of the dye on the banknote surface or surfaces from other forensic samples such as clothes, furniture, car components and other crime objects. Therefore, the use of an ambient mass spectrometry, herein specifically EASI-MS, seems promissing owing to its direct, nearly undisturbed analysis with sufficiently low LOD. The possibility of investigating the spatial distribution of the dye along the whole surface, even in areas subjected to apparently successful clean up procedures, is also attractive. 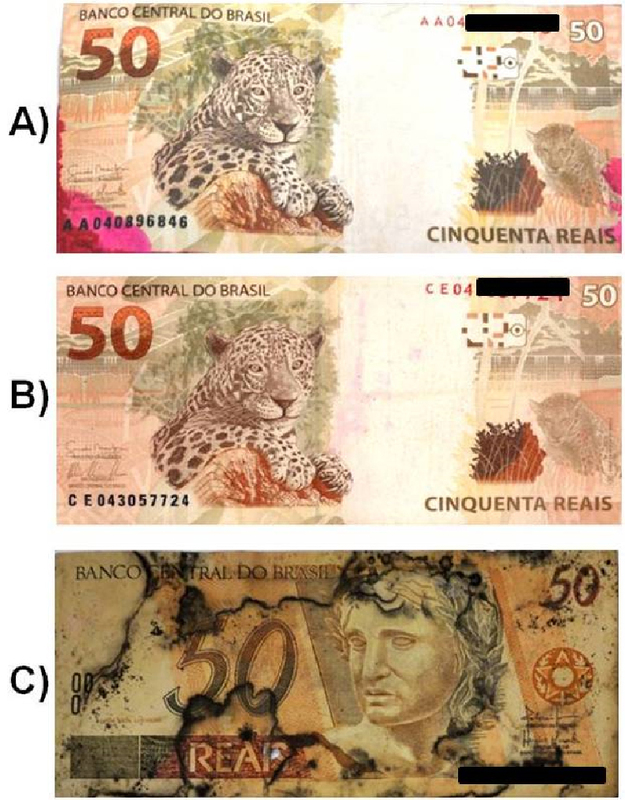 Therefore, using Brazilian banknotes as a test case, forensic examination and identification of Rhodamine B dye (m/z 443) as anti-theft device (ATD) staining on banknotes was performed. EASI(+)-MS has been shown to function as a suitable technique for the surface inspection of suspect banknotes from ATM explosions contaminated by the ATD dye Rhodamine B. Fig. 2. 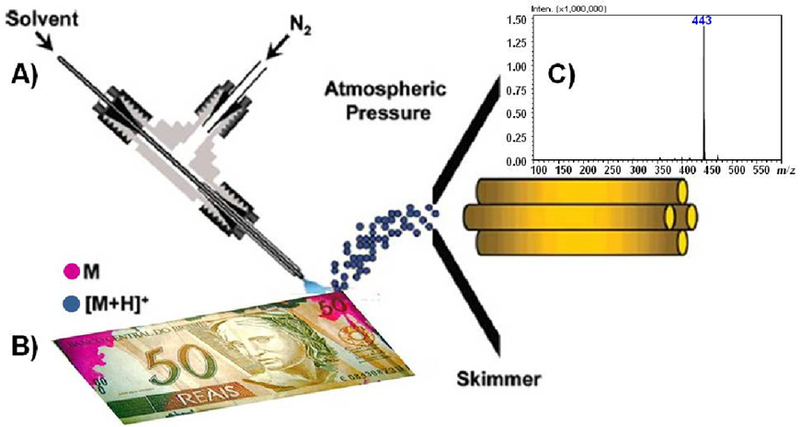 ATD contamination inspection directly from the surface of a Brazilian banknote via EASI(+)-MS: (A) Schematic of the EASI-MS system, (B) A real ATM stained bamknote (C) The EASI mass spectrum acquired. M represents the neutral analyte laying on the surface of the banknote (red stain) wereas the blue dots represents the protonated analyte molecule [M+H]+ formed after dessorption, ionization and transfer to the gas phase. This desorption/ionization ambient technique provides a direct, robust, rapid, non-destructive, and reliable molecular fingerprinting method, ensuring forensic sample preservation. The EASI source is also very simple and easily implemented in all types of mass spectrometers operating with atmospheric pressure ion sources. Characterization of anti-theft devices directly from the surface of banknotes via easy ambient sonic spray ionization mass spectrometry.